When we were first considering a move into our current home, my wife and I made a list of things that we wanted to have in our home that we just didn’t have room for in our small apartment. One of the big items on that list was a deep freezer. We wanted one primarily because we often had offers of buying shares of venison or beef, where entire animals had been processed at a meat locker and the person was hoping to get back some of their investment by selling a quarter of the meat. Per pound, this was an incredible deal, but you would often have to deal with thirty or forty pounds (or more – sometimes much more) of wrapped and processed meat. We also wanted to take advantage of specific sales at the grocery store. For example, if a store has a sale on flash-frozen vegetables, we’ll often stock up on them. As we moved into our current home, we had money set aside for buying a deep freezer, an amount based on the prices we could easily find at the time. We knew some of the specific models we wanted that had a good “bang for the buck,” and we had the cash in hand. Time to buy, right? The thing was that we didn’t immediately need that deep freezer. 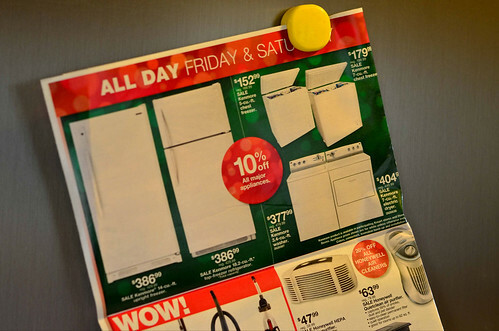 Yes, we wanted one and it was clear that over the long run such a freezer would save us money, but we weren’t pinned up against the wall with regards to the purchase. This distinction between want and need is a key one. It is incredibly easy for people to decide that something useful that they merely want is actually more of a need – something that they have to go out and purchase right away. I see it all the time with people in my social circle, and I even see it uncomfortably often in myself. Holding back on those “wants that seem kind of like needs” is essential for saving money. What are you holding back for? The sale. There are many ways where you can find that item that you’re looking for at a much lower price than what you’ll see at your local department store or appliance store. All we did is sit on this idea of buying a deep freezer for about two months. We watched the ads from the local hardware and appliance stores, waiting for a great price on one of the models we wanted. Eventually, we found it on sale at about a 35% discount, saving us quite a bit of money. Even better, during that period, a friend of ours came up with a used deep freezer that he offered to give to us. We were strongly considering taking the item, even though we were a bit concerned about the fan motor in it, but we went for the discounted one instead. We didn’t lose anything by waiting, but we gained about the third of the cost of our deep freezer. This type of story repeats itself time and time again when you’re making any major purchase. The price you find today is likely to be easily topped if you exhibit a little bit of patience, and considering that the items that you’d do this with aren’t really essential to your day-to-day life, there’s no real drawback to waiting. What kind of threshold should you have for pulling the trigger? For me, I usually try to wait for a price that’s at least 20% lower than the lowest regular price I found when I was initially searching for the item. How long should you wait? This is really up to you. What I typically do is wait until I notice a continuous stream of possible uses for the item I was considering buying. Whenever I notice a use, I bump my threshold for buying closer to the lowest regular price until it becomes clear that the item is nearly a “need” in terms of how we live our lives, then I’ll just go for the lowest-priced version I can find. Patience is the key, and patience pays off time and time again.